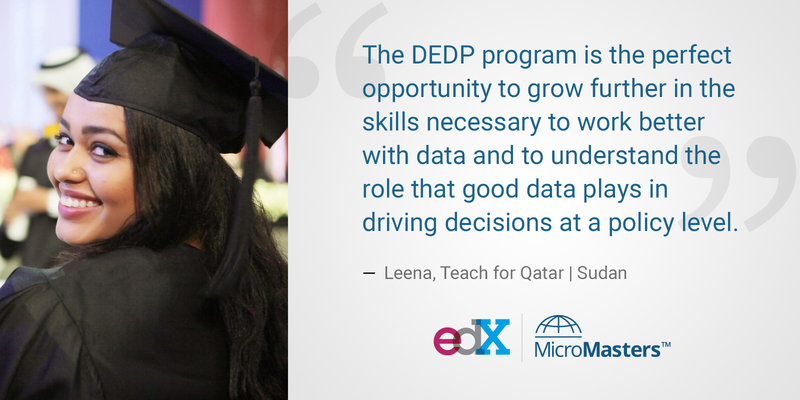 The DEDP program, to me, is the perfect opportunity to grow further in the skills necessary to work better with data and to understand the role that good data plays in driving decisions at a policy level. In addition to professional reasons, I also dream, like anyone from a developing country struggling with issues of poverty and inequity, of somehow making a difference. The courses I am enrolled in so far have challenged me and helped put me on the right track to formulating a better idea of the kind of impact I would like to have, whether in Sudan, or elsewhere. 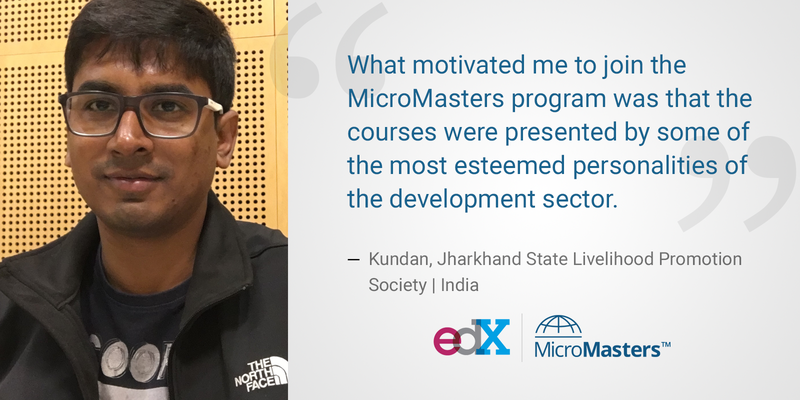 What motivated me to join the MicroMasters program was the way the course curriculum is designed and that the courses were being presented by some of the most esteemed personalities of the development sector. The courses on Data Analysis and Microeconomics provide a solid foundation on which the other three courses build to provide real life examples, empirical frameworks and other practical aspects that are frequently encountered in the development sector. The program appeals to me for couple of reasons. Firstly, the program offers continuity in my line of work as it is well connected to the portfolio of activities carried out at the World Bank, Strategic Impact Evaluation Fund. Secondly, the rigorous training in impact evaluation and statistics allows me to hone my analytical skills and I very much enjoy the opportunity we have to collect data through Survey CTO and carry out analysis in STATA, R. Thirdly, the multidisciplinary nature of the program offered by leading faculty members and the exposure I have to different topics provides me with well-grounded knowledge in diverse arrays of this field. Finally, the opportunity to pursue further studies at the MIT campus, if granted admission, will not only offer me the chance to enhance the knowledge already gained through the online platform, but also combine it with hands-on experience through the internship program. 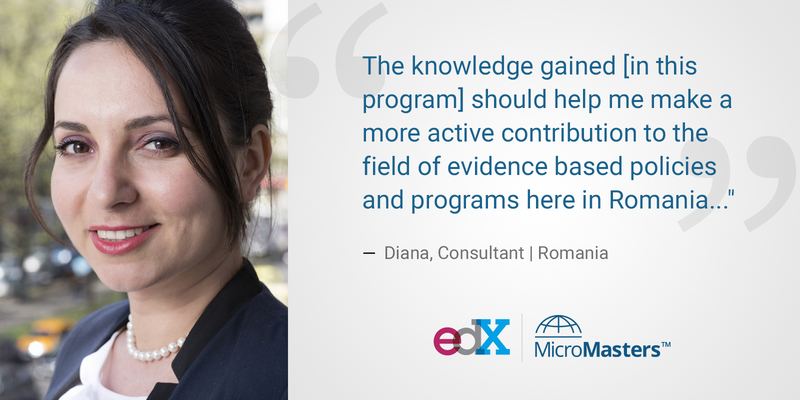 The knowledge gained should help me make a more active contribution to the field of evidence based policies and programs here in Romania, a field which has not yet been explored. It seemed reasonable to do a Masters in economics, in the hopes that I would be able to design better policies and interventions for the development of my country, improve the lives of my compatriots that are poor.Thankfully, I got into economics and I am now in my second year. On one hand, I am satisfied with what the economic knowledge I am gaining. On the other hand, I was disappointed because the economics of the poor and how to improve their lives was rarely discussed or presented in class. And this is what this Micromasters in Data, Economics and Development Policy is giving me. One of the courses I am taking so far is Challenges of Global Poverty. I can relate my life and my experience to every topic and this makes my learning more enjoyable. 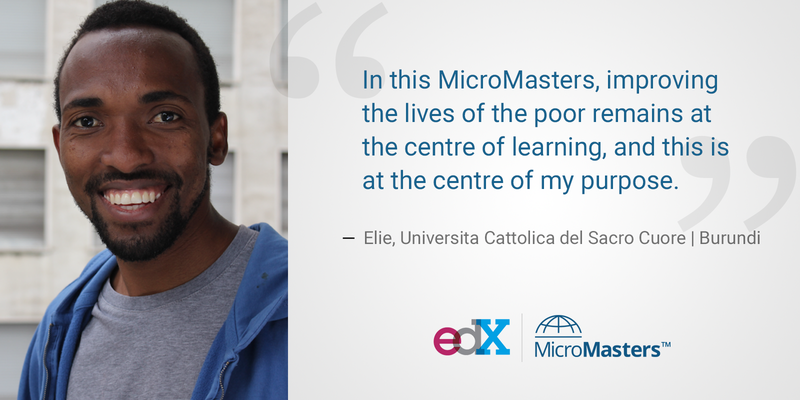 In this MicroMasters, improving the lives of the poor remains at the centre of learning, and this is at the centre of my purpose. 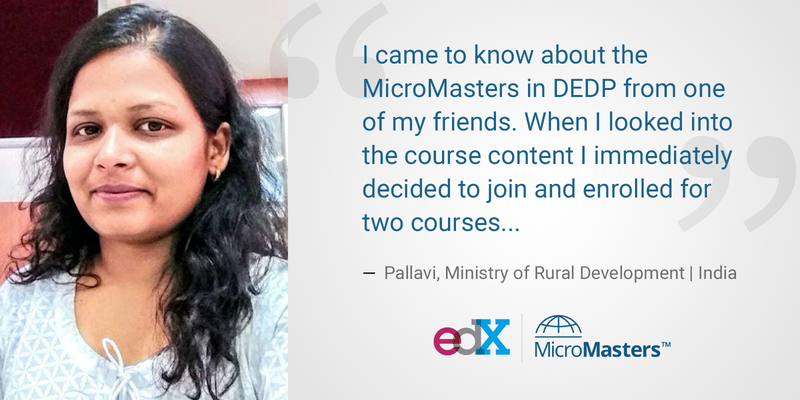 I came to know about MicroMasters in DEDP from one of my friends. When I looked into the course content immediately I decided to join and I enrolled for two courses this time. Though I am enjoying both the courses, I like studying Foundations of Development Policy the most. Before joining this course I did not know R. Thanks to MicroMasters for the motivation - I learned it in no time! The most fascinating thing about these courses is that I got to read a lot many papers by the great researchers across the world. The insights from the videos and the quizzes were equally useful and thorough understanding of the paper could have been difficult without homework assignments.So far my knowledge of the developing world was quite limited to India. This course gave me an opportunity to get to know about the development issues and policies in other developing countries as well. Overall, MicroMasters is enabling me in achieving my dream of contributing to the development economics and public policy.